Remember you are loved with each peaceful chime of Alexdandra Paliwoda's handcrafted design. As the wind flows through these enchanting bells, we hope the chimes remind you: You are always loved. 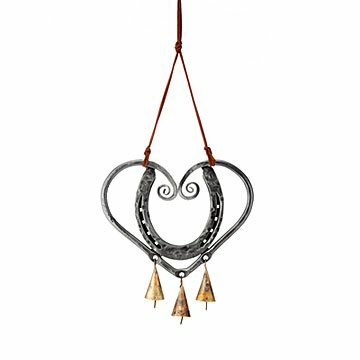 Alexandra Paliwoda handcrafts the design with a recycled steel "lucky" horseshoe and tiny bells inspired by her travels to India that emit subtle, peaceful clinks. The meaning you give to it is yours, whether it reminds you of a significant other, family member, or something universal like harmony in the world. Just as lovely inside as it is hanging from your porch, the piece is durable through sun, wind, and rain. A sentimental gift for newlyweds, gardeners, or loved ones who embody kindness. Handmade in Idaho. Inspired by all things wild and free, Alexandra Paliwoda expresses her love of untamed places with her hand-forged ironwork. Born in the Rocky Mountains and raised in the backcountry of Alaska, she began working with metal in 2000, when she was certified as a farrier by Montana State University and forged horseshoes. Working with horses and in agriculture, and living a subsistence lifestyle in Alaska—including building her own cabin in the north country—she feels that the most important things in life are the experiences. Chime may rust over time if hung in humid or outdoor environment. I love this wind chime. It is beautiful and well made. Unique chime for a beautiful, rustic patio. Our last name is Shoemaker so the horseshoe was perfect! Love the uniqueness and story behind this wind chime.